Enter Marjorie Harvey, a TV personality, style blogger, Instagram darling, and the mother of seven kids. She’s also the wife of Steve Harvey, the multi-hyphenate Hollywood mogul and recent Miss Universe host. As a designer client, fashion fan, and the auteur behind the website The Lady Loves Couture, Harvey has easy access to the industry’s most elite season, and shares a front-row perch with celebrities like Gwyneth Paltrow and Anna Wintour. We chatted with Lady Marjorie at her Paris hotel suite to talk about couture, Karl, and Walmart (really). Yahoo Style: Let’s start with the basics. What makes a couture show so special, compared to a “normal” catwalk? 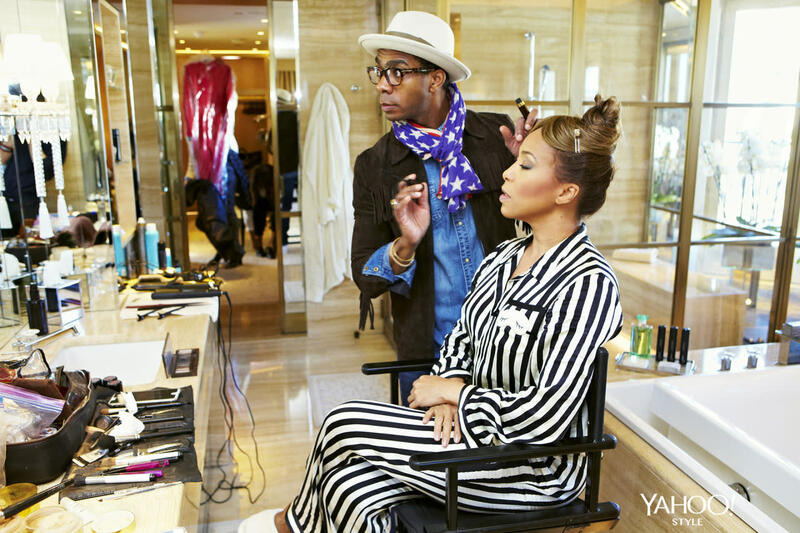 Marjorie Harvey: The thing about haute couture is the details. The amount of work that goes into each garment makes it a real work of art. It’s like viewing paintings in a gallery. You know the level of talent and discipline it took for the masterpiece to happen, and most of these garments are masterpieces. So to see what has taken months to create, first in the designer’s head, and then sketched on paper, and then to have dressmakers produce it, and then to present it on a runway with over-the-top, theatrical sets and music, and cinematic locations—it’s an incredible experience to see it firsthand. As a couture client, your first step is to attend the fashion show. Let’s say you want to buy a dress. What happens next? What have you loved this couture season? I loved Giambattista Valli. Dior was incredible. They did a fantastic job. They don’t have a “designer” right now, you know, and it was still incredible!… And of course Chanel! Karl Lagerfeld is a genius. The last look was a couture bomber jacket?! I was dying for that… He thinks so outside of the box and to see something from someone with a mind like that is incredible. Are you and Karl Lagerfeld friends, at all? No, Karl and I are not on speed dial. He’s not coming to have a coffee date with me and the girls. We’re not BFF. He’s incredible but it’s not like, “I need to be besties with these people.” I’m not a groupie, you know? I don’t get hung up on being best friends with the designers. Plus, most of my friends aren’t the age of my dad. Actually Karl is older than my dad! So we don’t really hang out. Ha! Just because it’s couture doesn’t mean you have to turn into a diva and say, “If I’m buying this dress, I won’t work with anyone but Karl!” You know? These people [in the couture atelier] are experts. I trust and respect them. You do hang out with Anna Della Russo though, right? Well, it’s a tight little club of people who go to couture. By going to the shows I’ve made friends with women from all over America, from the Middle East… and Anna goes to even more shows than I do! She’s non-stop. I need whatever vitamins that woman’s on, and whatever workout she’s doing. She is amazing. Do you have any favorite models at couture? It’s unfair, right? But Naomi, she’s been a sweetheart to me. I love her; I love her. She’s got a little attitude but it’s good. You need a little attitude to let them know you’re alive. What happens after you buy a couture dress? Well, when it gets delivered to your house, it comes in such a huge box or bag that it looks like they’re delivering a body to your doorstep! They package it extremely well. Do you have special closets that are temperature controlled for couture? No, I have normal closets! But I do I have some mannequins that some of my couture pieces are on. Some are just on hangers, though. It’s not like I have them framed. I don’t buy them as museum pieces. They are things my children and grandchildren will love for years—actually, honestly, my children already love shopping in my closet. Do you ever bust her on Instagram? Like, she posts a selfie, and you spot your designer dress that went missing? All the time. And then with handbags—all of my daughters can wear my handbags, regardless of their size. So there have been some disappearances. I’m going to have to start using LoJack on my purses. Most people can’t buy couture, ever. Why is this season still so important, not just to you, but to everyone who loves fashion? Because it inspires other brands as well. Haute Couture trickles down, you know? You may not buy couture, you may not even buy designer clothes; you may swear you don’t even care about designer clothes. But everything in Walmart is inspired by Haute Couture! That’s why it kills me when people say, “[couture] is so shallow.” Sweetheart, I don’t care wherever you bought something. It was all inspired from here. Award Season is here, and it seems like there’s a red carpet every five seconds. What would be your advice to celebrities, and also to fans of your website who want your fashion advice? I don’t want a stylist to dress me the way THEY want me to look. I want to wear what feels good to me, and what mood I’m in. Sometimes, guess what? It may be a runway piece. Or it may not be. Just have fun with it. Let whatever you wear be a part of you.